Wearing red glasses, painted shoes, and bright lipstick, everything about Tut Riddick is colorful and alive. 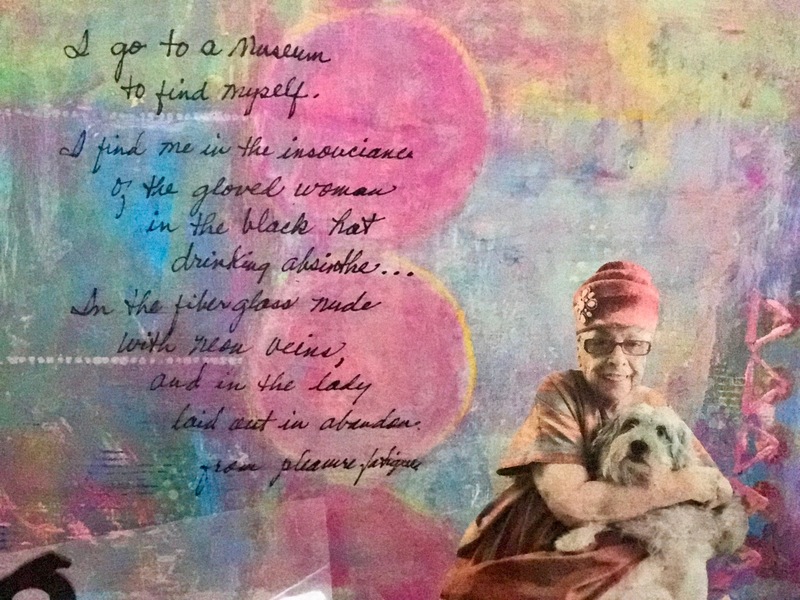 She wears a necklace that says, “Growing old is inevitable, growing up is optional.” Often described as the “Godmother of art” in Mobile and her hometown of York, Alabama, Tut is 88 years old and still constantly curious and creative as she paints or writes poetry and letters every day. Her bedroom shelves are lined with journals filled with stories of trips, conversations, phone numbers, sketches, and church bulletins covered in notes such as “we should never outgrow our need to study.” Every journal is labeled: New York 1974, The West 1981, and Penland 1979. Books on politics, art, injustice, and a $500 house in Detroit are piled next to a statue of Barack Obama on the nightstand by her bed. Hats are stacked on mannequin heads and newspaper stories about friends are tacked to her closet door. 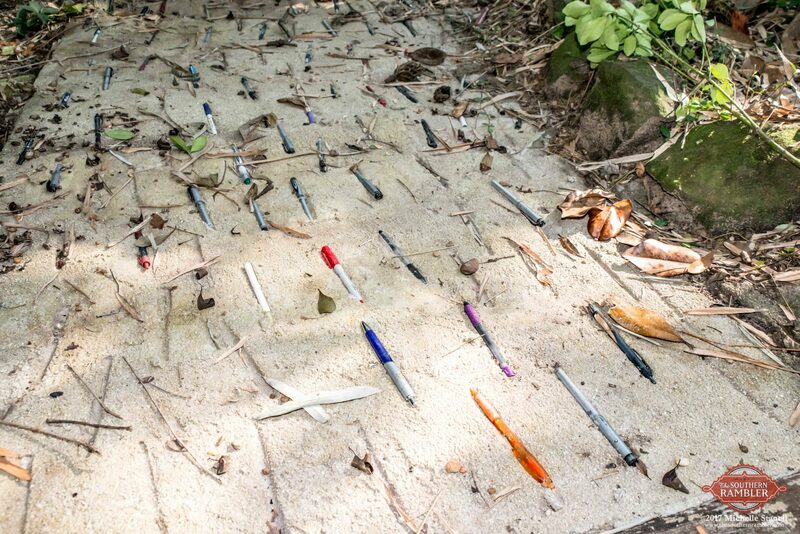 Outside is a walkway made of pens, broken bits of pottery, a telephone cord and glasses. The neon heart on the roof is a gift from her husband, Harry, and she turns it on when she knows friends are stopping by. A sign by the front door says “Welcome to the Fun House” and Tut’s schnauzer, Zorba, is always by her side. 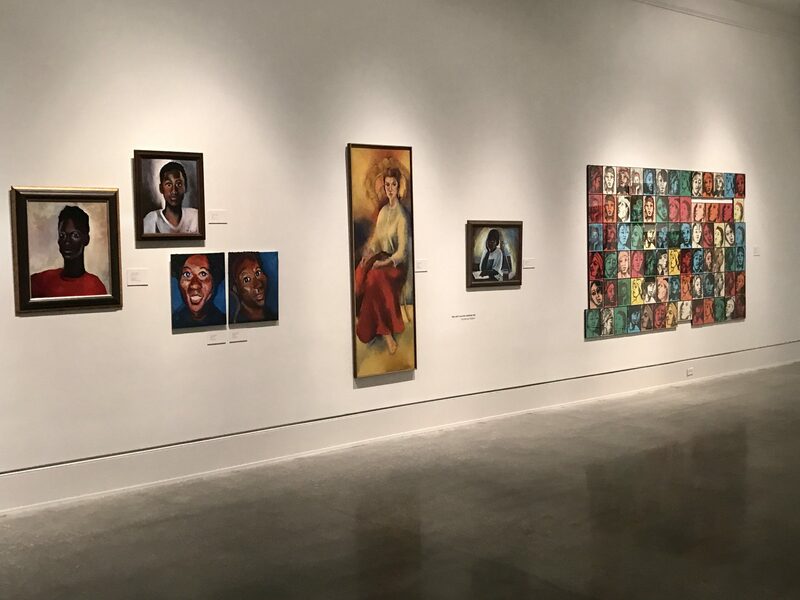 Tut has just been recognized as one of five artists who are an “integral part of the contemporary art scene” in 5 Mobile Artists at the Mobile Museum of Art. The exhibit opened October 6 and displays some of her portraits from the 1950’s to ones she did a few weeks ago. 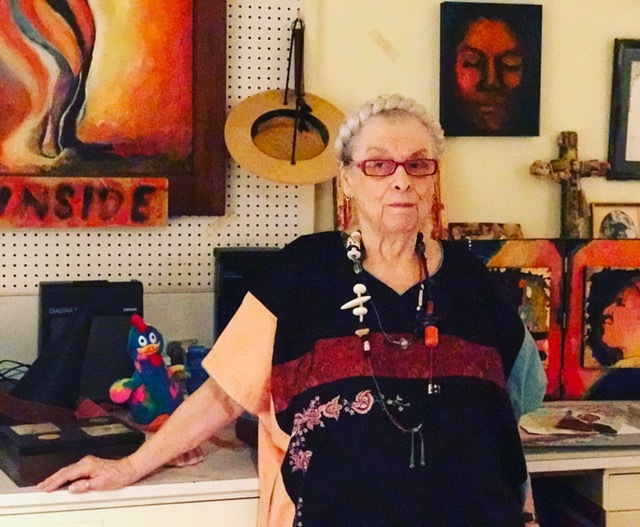 She has received the Governor’s Arts Award and is in the Black Belt Hall of Fame for her contributions to art in Alabama. 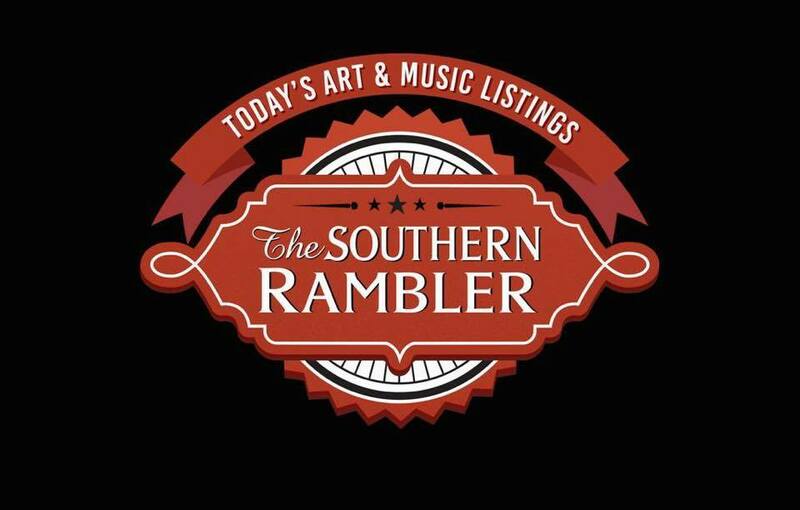 There is also a collection of her paintings in the Riddick Art Gallery at the University of West Alabama. 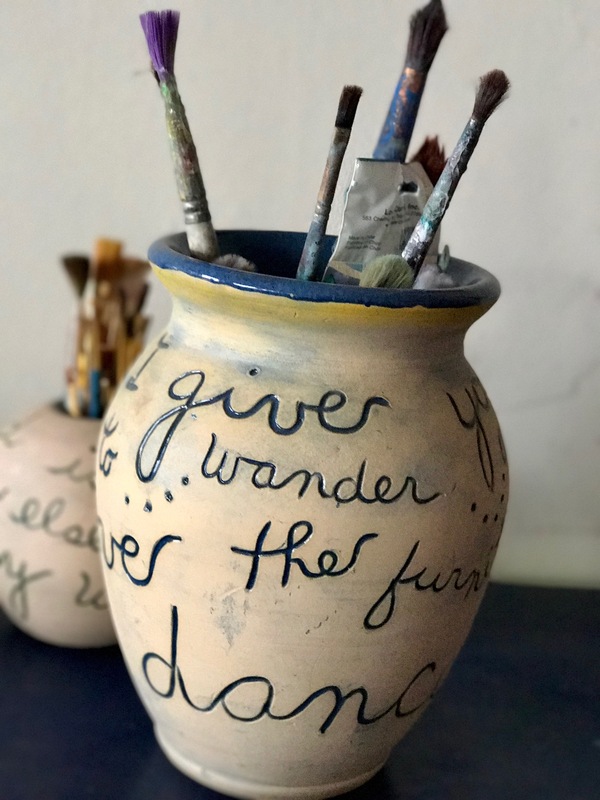 She went to art school in Paris and New York and spent 30 summers at her beloved Penland School of Crafts in North Carolina. 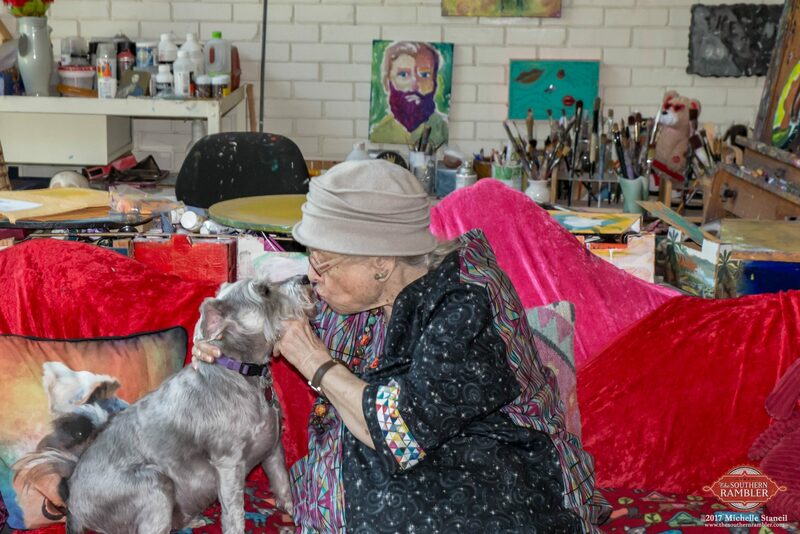 She has worked in photography, screenprinting, plaster, etchings and lithographs and could have been a successful artist anywhere in the world, but stayed in Alabama and dedicated herself to bringing art to Mobile and York. 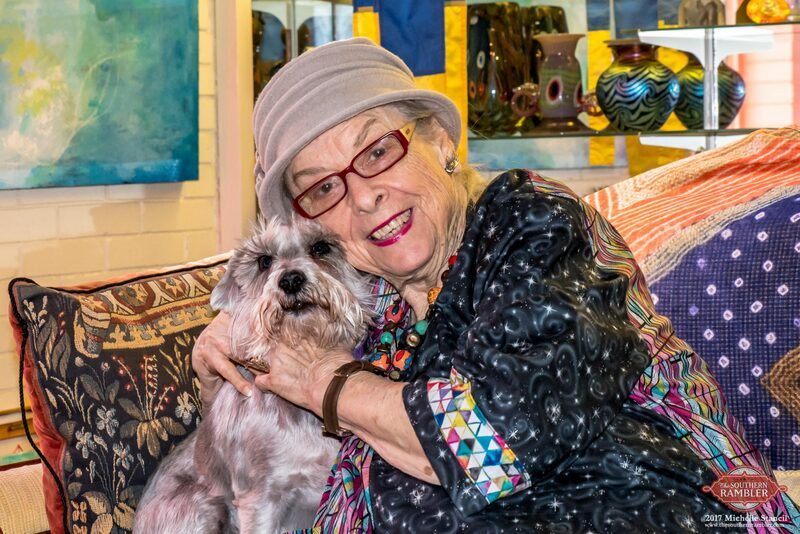 She was recently given the Lifetime Achievement Arty award from the Mobile Arts Council. Words, not art, brought Tut to Mobile. She was the first female debate champion at the University of Alabama and was hired as the debate coach at Murphy High School. She also taught art and literature at Glendale High School in Prichard. The Altmans owned timberland in Sumter County and the family money came from her Uncle Henry who collected gold and cotton and hid them in the swamps of the Tombigbee River at the end of the Civil War. He lived next door to his brother and one was for the war, the other against it. When the war was over, Henry took the cotton to Mobile and sold it for a large profit. The money was later passed down to her grandfather who opened the first bank in York. She says coming from a prosperous family of free thinkers gave her the armor and courage to be herself. Tut is also sensitive and appreciates feeling emotions from other artists as much as she does expressing herself. She screams at a painting of a woman screaming because it was the way she felt after the presidential election. She goes quiet and puts her hands over her heart when she is moved by a mural of an old man’s overworked hands. Tut bought Smith’s pottery through the lean years, giving him breathing room to be creative and become an artist. He says her knowledge kept him from reinventing the wheel, but he had to listen. 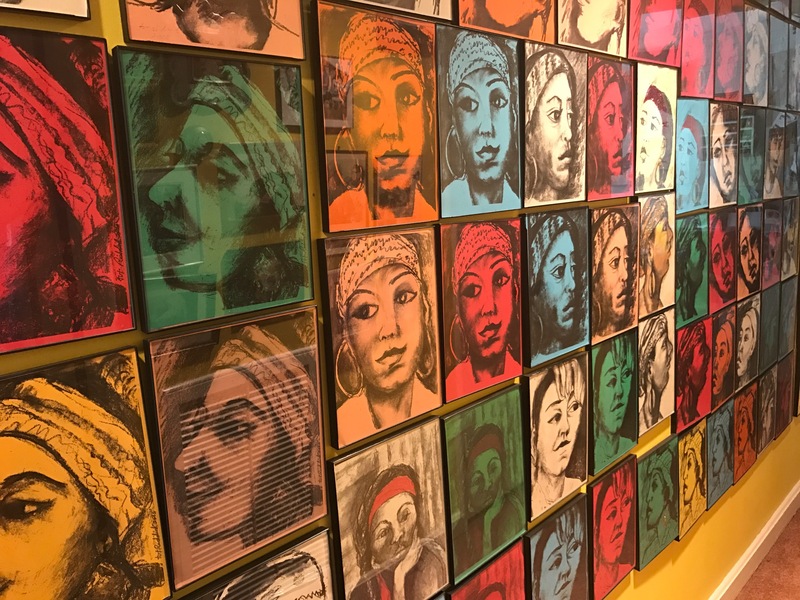 She paints the beauty of black faces, creating art that has soul, vitality and life to help us understand each other. 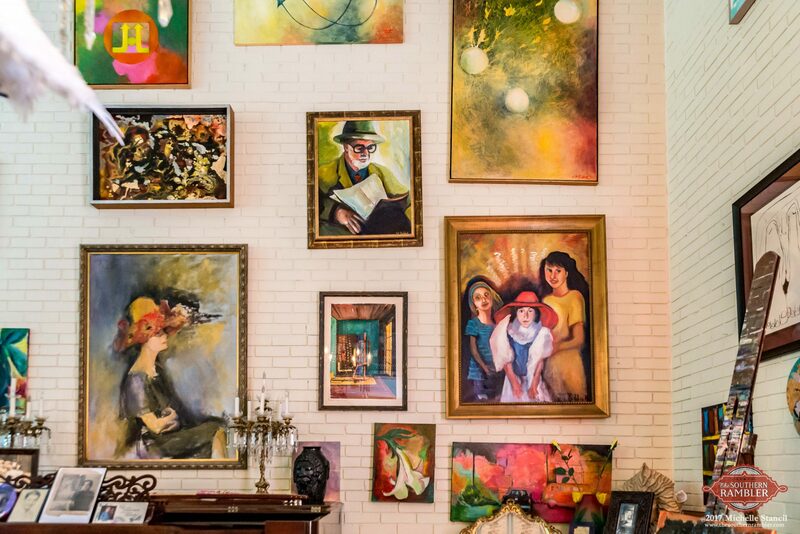 Some of her favorites are a collection of portraits of performer Josephine Baker and a wall of portraits showing the range of emotions of Tameka, who cares for Tut and Harry in their home. 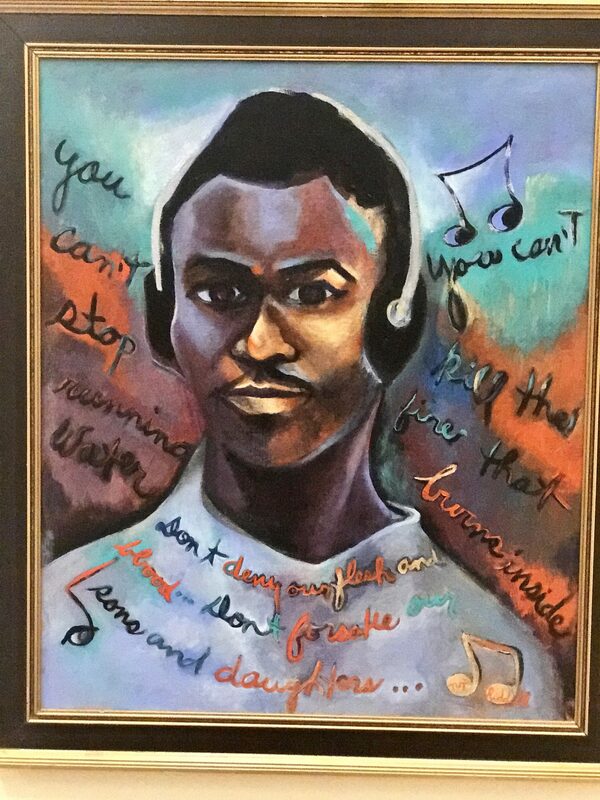 “Running Water” is a portrait of a young black man wearing headphones with the words: “You can’t stop running water. You can’t kill the fire that burns inside. Don’t deny our flesh and blood…Don’t forsake our sons and daughters…” written around the edges of the painting. 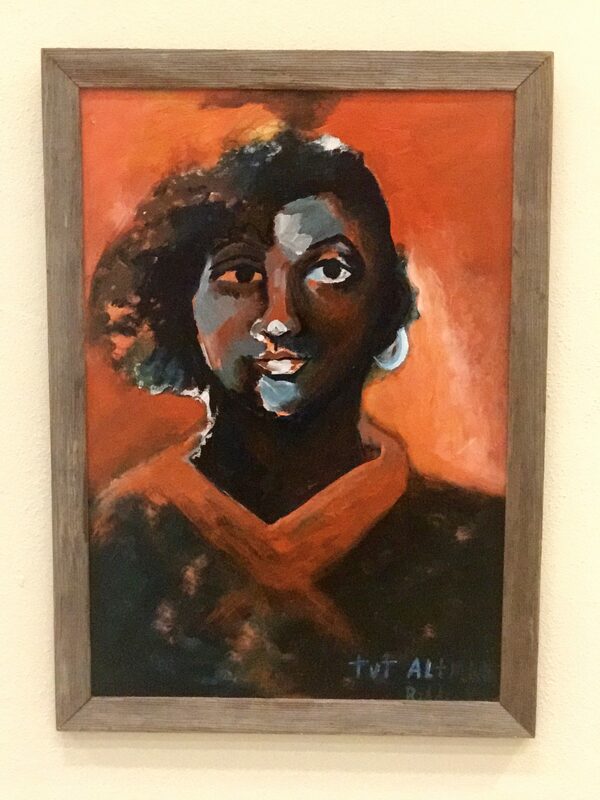 Tut created the Coleman Center in York in 1985, and gave much of her career to bringing art and hope to her hometown and the Black Belt, one of the poorest regions in the country. 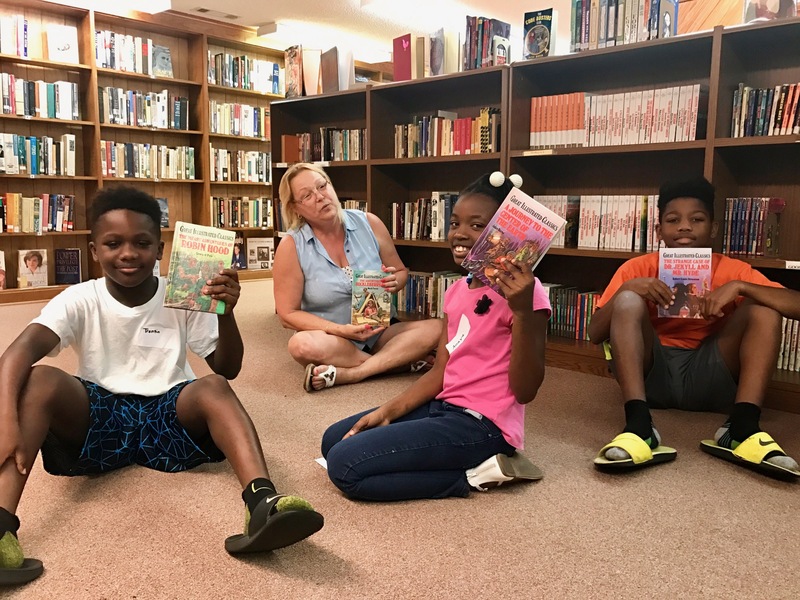 Supported by state and national foundations including the Andy Warhol Foundation for the Visual Arts, the center still provides art classes, a library and place of creativity for children. Kids cover roller skates in paint and glitter and read Sherlock Holmes and Huck Finn. 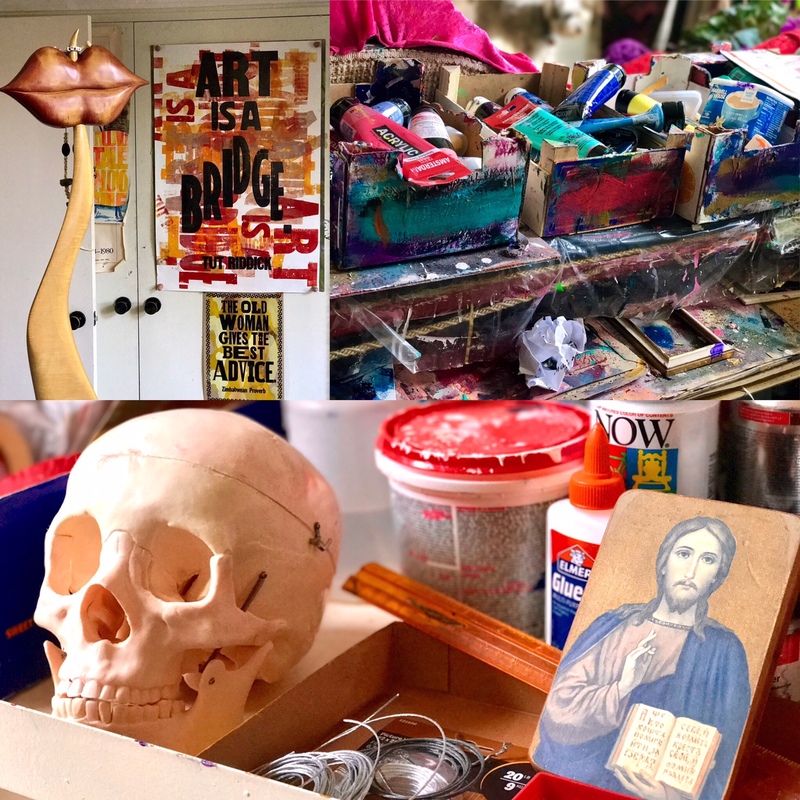 Tut brought in artists to teach at the Coleman Center and some stayed in York for years. Letterpress printer Amos Kennedy is a Glasgow Artist Fellow and in 2016 received a $50,000 Artist Assembly grant. He lives and works in Detroit, but his breakthrough happened when he moved from New York to York. Lilly Mack worked at a garment factory in York and made clothes and quilts on the side. 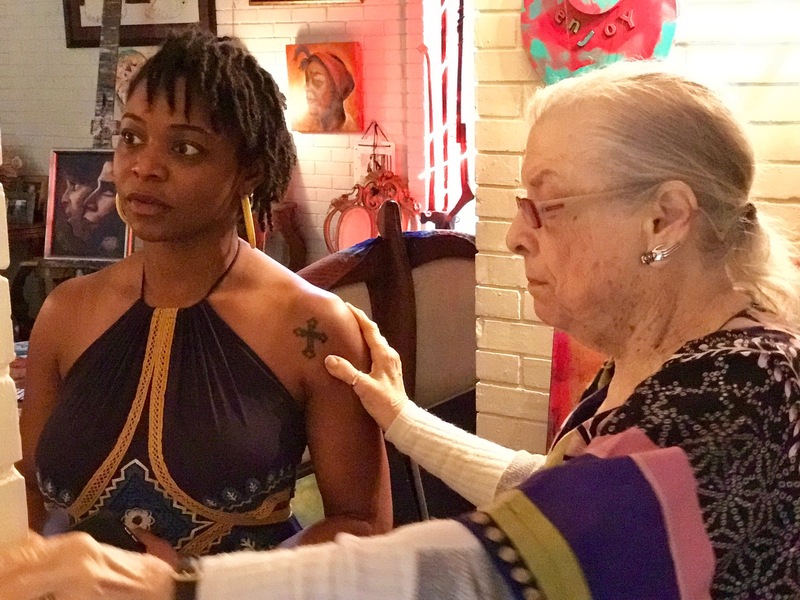 After the factory shut down, she joined Black Belt Designs started by the Coleman Center to help factory workers who lost their jobs. I don’t have to wait. The world comes to me. Tut has survived cancer on her vocal cords with surgeries where it “hurt too much to cry.” She only has one vocal cord now and says being a survivor and an old woman gives her permission to say what is on her mind. Part of her “mothering” is writing notes and letters to the people she takes in. 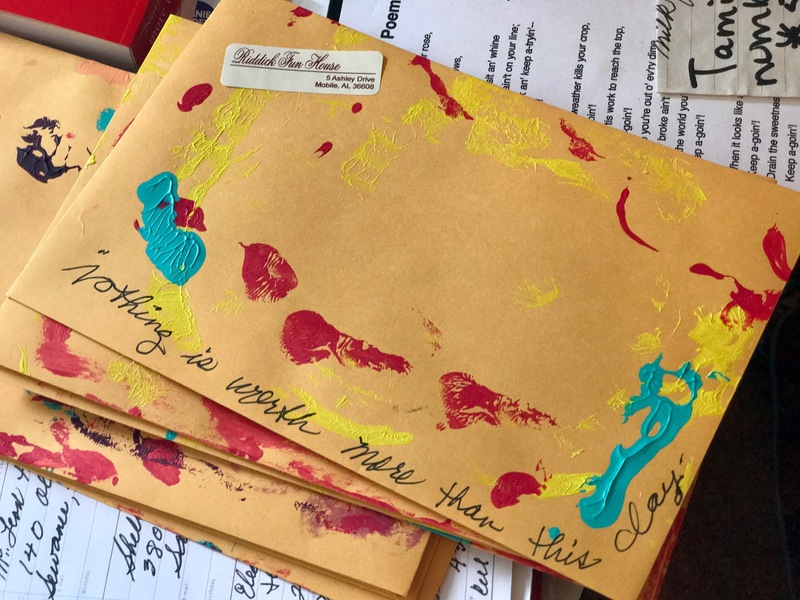 She calls it her “ministry” and sent out more than 1,000 letters last year. Notes of encouragement and congratulations, thanking someone for a visit or suggesting a person to meet. The letters often include a poem she just wrote or a photocopied picture of a painting. Letters signed with “Love and Joy,” “Love and gratitude,” or “Darling, I’m proud of you’ and mailed in envelopes painted and glittered with Riddick Fun House on the return address and “Nothing is worth more than this day” written across the bottom.